We are currently standing before one of the most unique and frightening periods in history. Never have there been so many extremes in so many different areas. 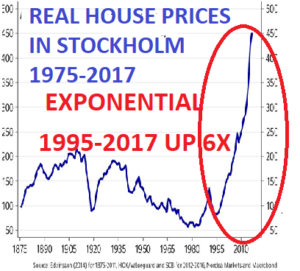 In the last 100 years everything seems to have developed so much faster, including population, technology, inflation, debt, money printing, budget deficits, stock, bond and property prices, crypto currencies etc. All of these areas are now in an exponential growth phase. The final stage of exponential growth is explosive and looks like a spike that goes straight up. A spike for a major sample like global population or the Dow never finishes with just a sideways move. Once a spike move has finished, it always results in a spike move down. It seems that everything in the world is developing much faster today like computers and mobile phones or robots. The world assumes that this exponential growth in so many areas will continue or even accelerate further. But sadly, that is unlikely to be the case. There is a more scientific illustration how these exponential moves occur and also how they end. Imagine a football stadium which is filled with water. Every minute one drop is added. The number of drops doubles every minute. Thus it goes from 1 to 2, 4, 8 16 etc. So how long would it take to fill the entire stadium? One day, one month or a year? No it would be a lot quicker and only take 50 minutes!That in itself is hard to understand but even more interestingly, how full is the stadium after 45 minutes? Most people would guess 75-90%. Totally wrong. After 45 minutes the stadium is only 7% full! In the final 5 minutes the stadium goes from 7% full to 100% full.